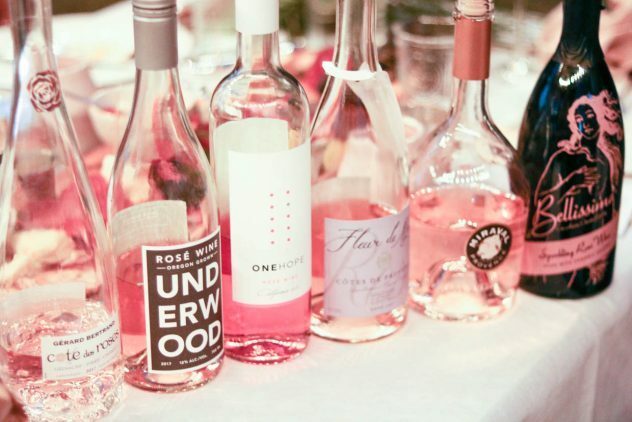 Gather your girlfriends together and host a summer rosé tasting party! Yes way, rosé! 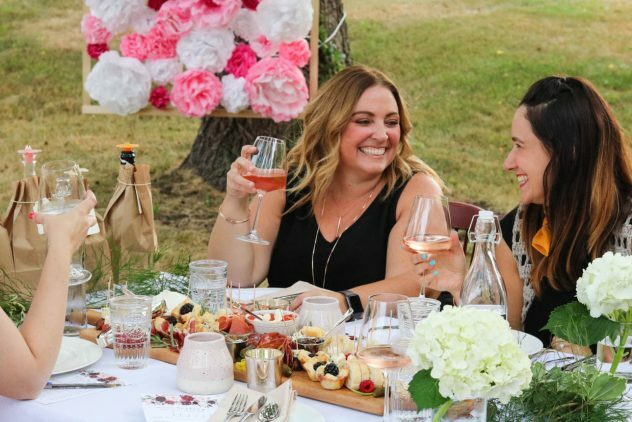 Enjoy a late-summer evening with your girlfriends by hosting a stellar outdoor rosé tasting party. 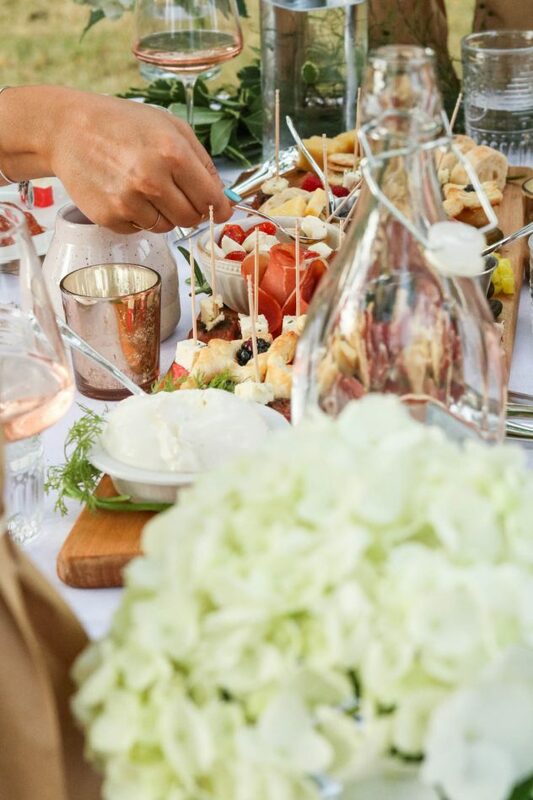 I’ll walk you through how to plan your menu, design your tablescape, pick out your rosé, and add in extra details that will create a fun, unforgettable evening for your guests. 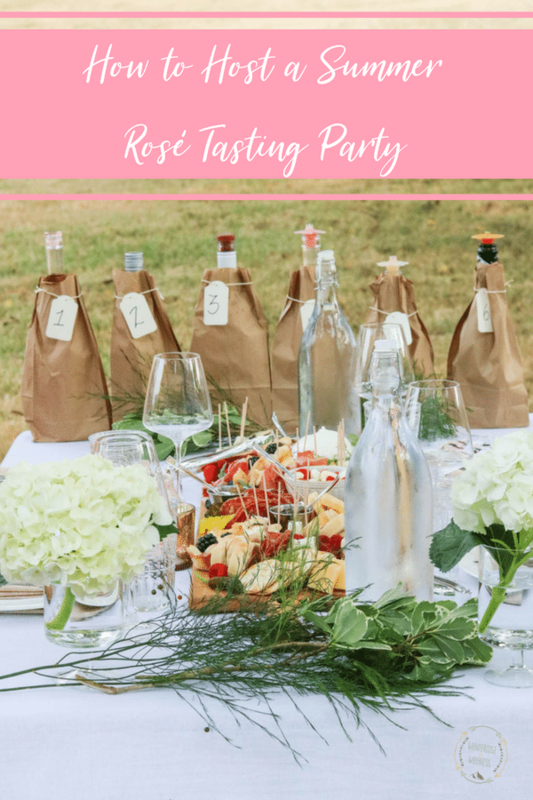 Let’s jump into planning your rosé tasting party, starting with how many guests you will be inviting. Do you want this to be a small event or a larger event? 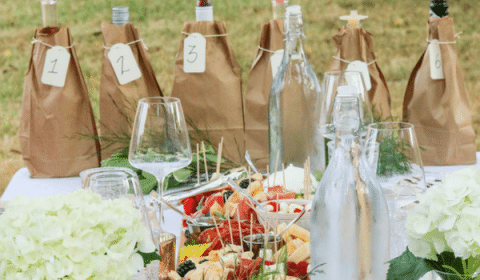 I chose to keep my rosé tasting party small and intimate, but before you begin planning your menu or tablescape, you’ll need to decide how many guests you’ll be inviting. Then, create a cute invitation through a free website like Canva.com. They have several templates to choose from, free stock images, and it’s super easy to use. Just create, save, and send electronically to your guests! 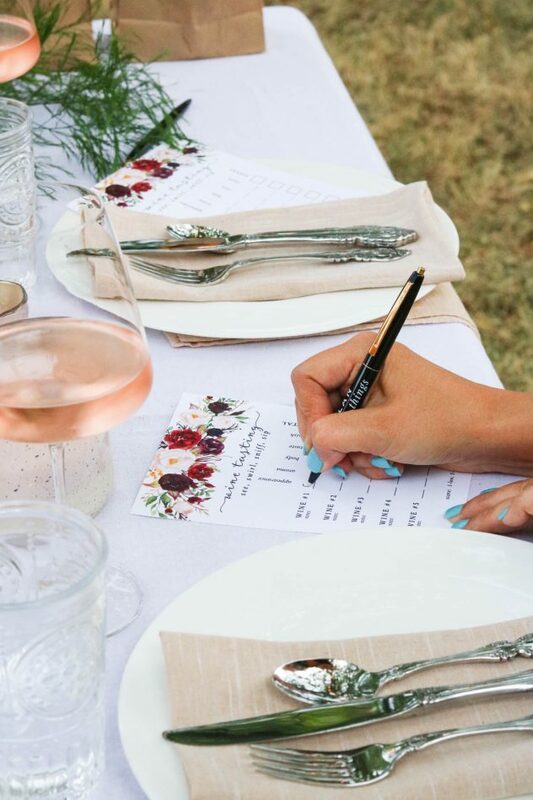 Once you have your guest list figured out, you can begin preparing your menu. 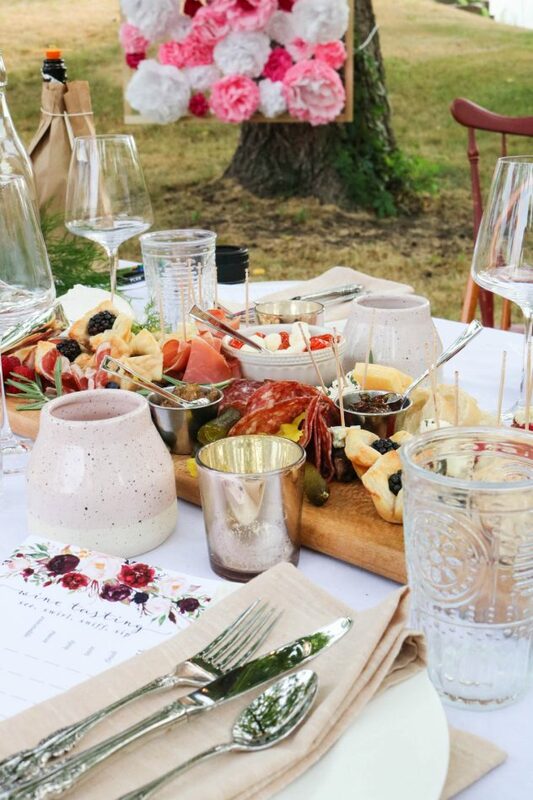 One of the easiest menus for a rosé tasting party is building a family-style charcuterie board. 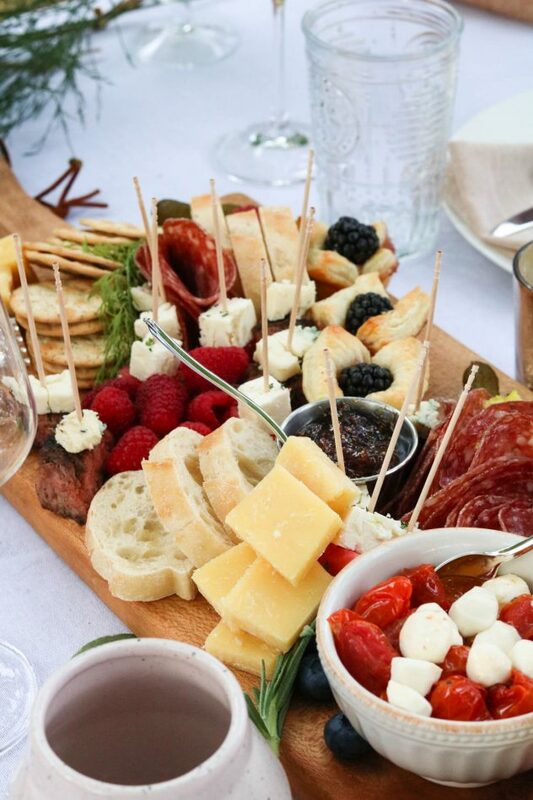 By creating an epic charcuterie board, you can bring in ALL the flavors, from salty meats to creamy cheeses, to sweet, fresh fruit. You can add in heavy hors d’oeuvres, too. 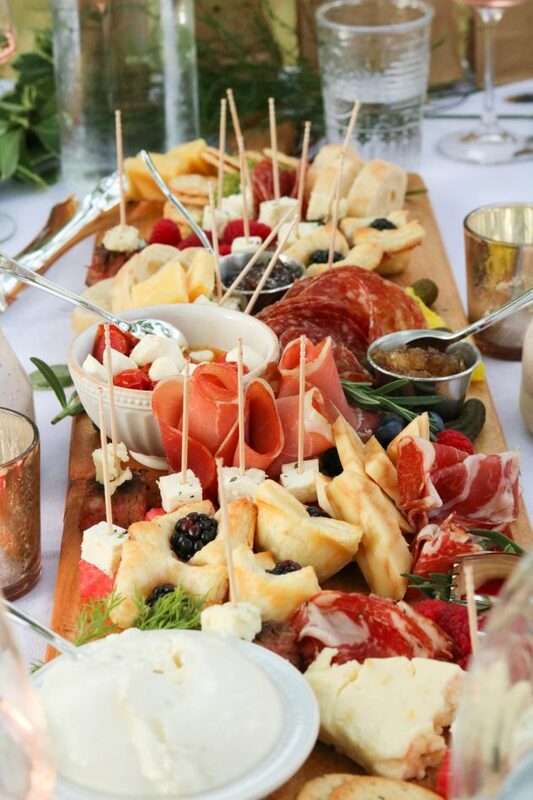 The creativity involved with building an epic charcuterie board is ready for the taking, all you need is your imagination and a love for all things food! Plus, this keeps your cooking to a minimum which means less stress for you in preparing for your party. For this family-style charcuterie board, I included a mix of both soft and hard kinds of cheese like burrata, sharp cheddar, brie, feta, blue cheese, and even a few exotic flavors like a soft mango ginger cheese and an espresso cheese. I added in a mix of prepared meats like prosciutto, salami, and capicola. I added a variety of fresh fruits such as grapes, blueberries, and raspberries. 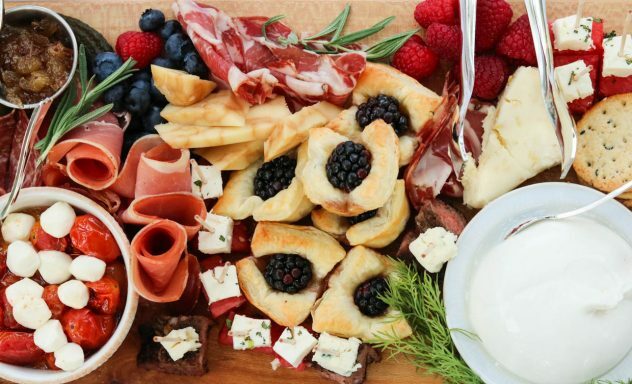 Then, I added in a couple heavier hors d’oeuvres like blue cheese steak bites, blackberry and brie puff pastry bites, blistered tomatoes with mozzarella, and watermelon, feta, and mint skewers. There were also fresh jellies and jams, from fig jam to a maple bacon and caramelized onion jam. Finally, I added a variety of crackers and fresh bread. Oh, and there was chocolate, three different varieties to be exact! It was an EPIC charcuterie board. Note: I have a nut allergy so there were not any nuts included in this charcuterie board. Lastly, I urge you to get creative and think beyond Ritz crackers and Colby Jack cheese. Try new things, be brave, be bold! Next, let’s talk tablescape and setting. Based on your guest list, you’ll know what type of table and seating you’ll need. Because my guest list was small, I could use a regular four-person kitchen table and four chairs. One of my favorite backyard tablescape settings is to use indoor furniture in an outdoor setting. If you don’t have a table and chairs easily accessible, you might check your local vintage markets. I was able to borrow a rustic table and chairs set from a local vintage market vendor! 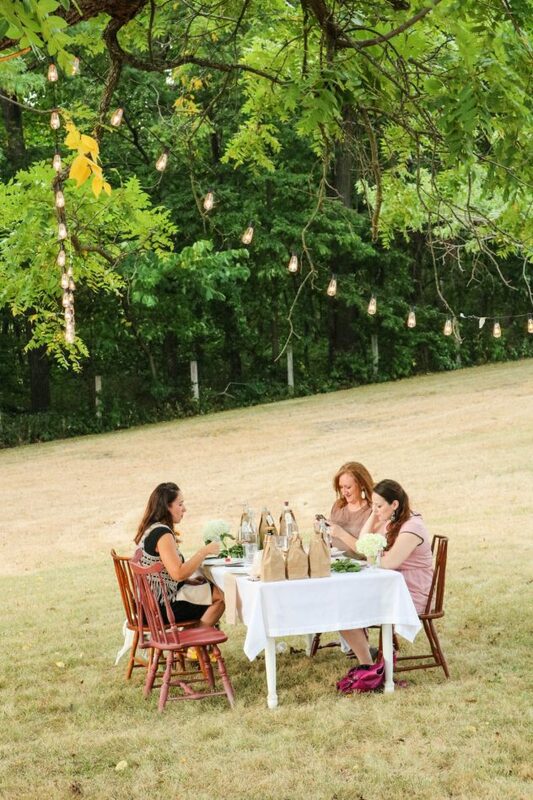 Lighting is also very important if you’re hosting an outdoor party. Large-bulb string lights are my favorite these days. They’ve been around for a while, which also means they’re accessible and affordable. I picked up these four strands at my local Michaels store, on sale for $10/box. I went with classic tablescape color scheme of whites and neutrals, letting the food and rosé bottles bring in pops of color. I then added in white hydrangeas, because hydrangeas are so gorgeous and they’re the perfect classic flower for a classic setting. You can then add in accessories like votive candles and greenery. 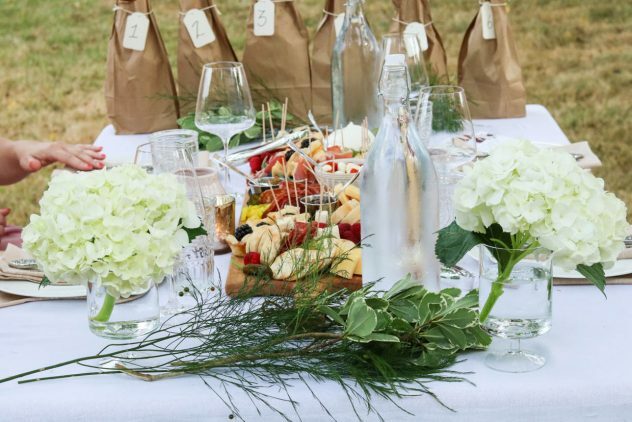 You’ll want both wine and water glasses for each guest, plus bottles of water for when they want to cleanse their pallet between tastings. 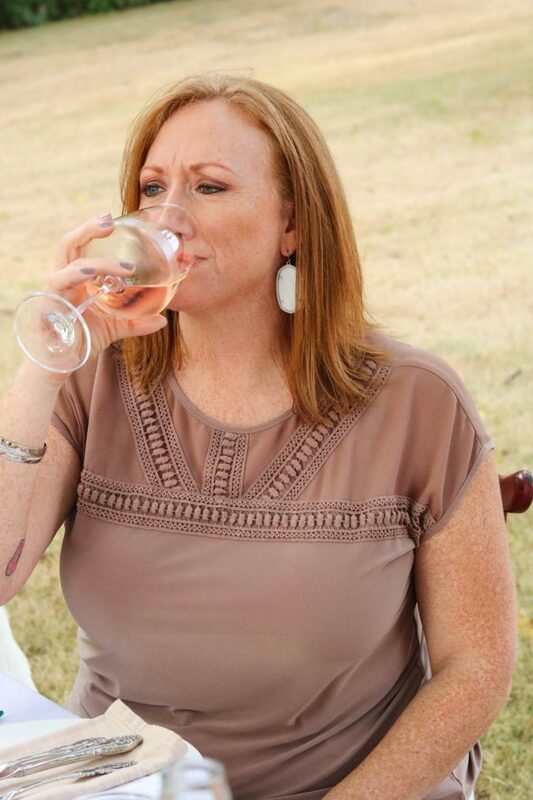 As with any wine tasting, include a couple of dump containers in the event that your guests dislike a wine flavor. Everything on this tablescape was purchased from HomeGoods, World Market, or Michaels. Home Goods is THE most affordable place for your tablescape pieces! Plus, once you’ve purchased them you now have them for future parties, win-win, right?!? 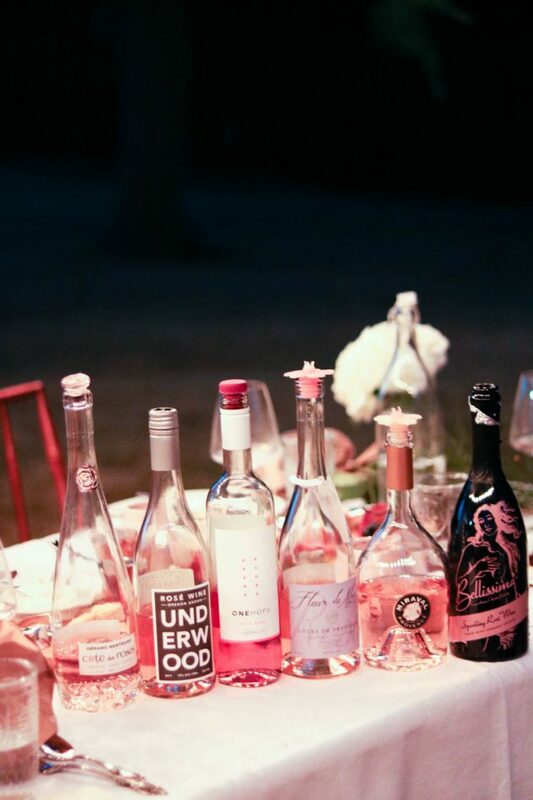 For the rosé tasting itself, you can either do a blind tasting or an open tasting. For fun, I went with a blind tasting. Each bottle was covered in a brown paper sack (also in line with the table setting colors) and assigned a number. 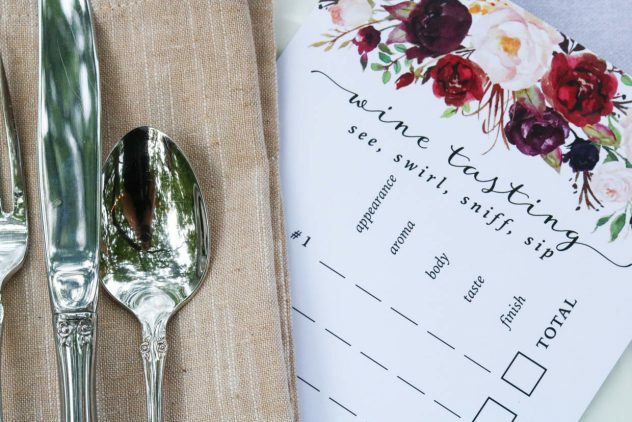 Provide each guest with a scorecard for each wine and let the fun begin! I found this gorgeous wine scorecard on Etsy.com. It was a simple file download, then I sent it off to print onto cardstock at OfficeMax! 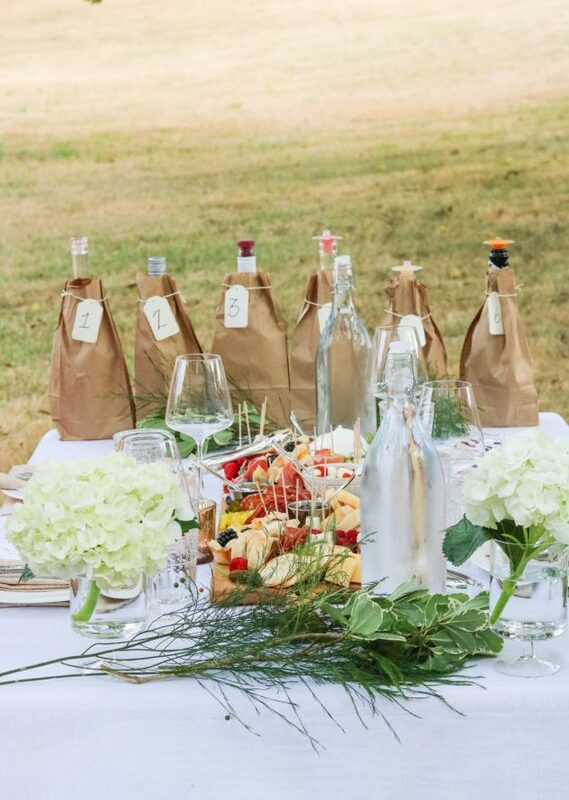 Give your guests ample time to try each wine, then cleanse their pallet. As we went through each blind tasting, we would chat about the wine, fill out our scorecards, and then enjoy some food from the charcuterie board. 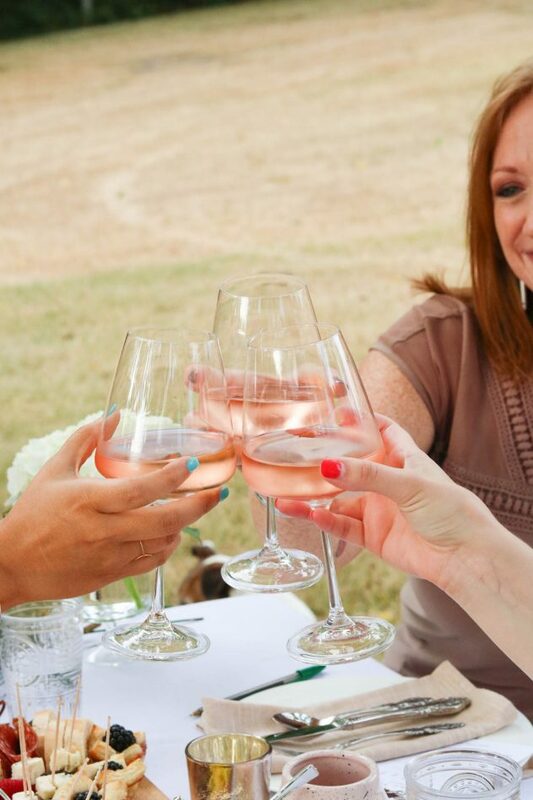 And of course, you must have a toast to your girlfriends and fun! Once the night began to wrap up, we did the big reveal. It was fun to unwrap each bottle and then revisit our rankings. One of the best places to find a good selection of rosé wines is World Market, however, most larger wine and liquor stores should have a decent selection. Create a fun and unforgettable night for your guests by adding in extra details, like this photo backdrop. 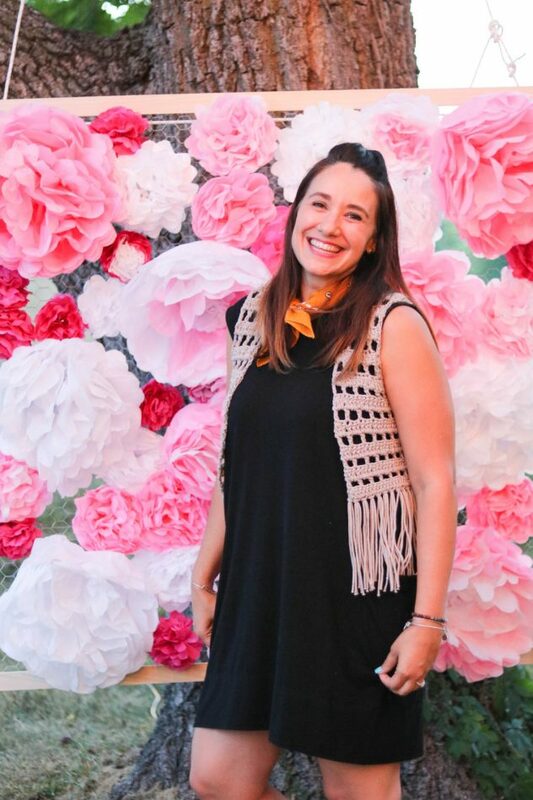 My dear friend helped me assemble this fun paper rose photo backdrop and the guests were able to leave the party with fun pictures! And dessert, what’s a party without dessert?!? 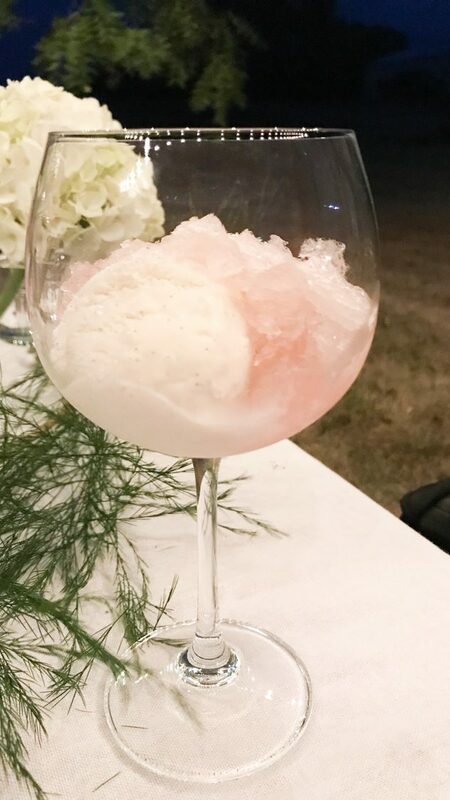 To end the night the guests enjoyed a rosé granita with vanilla bean ice cream! Most importantly, enjoy the evening. Keep your party low maintenance and stress-free. Hosting and entertaining are not enjoyable if you’re frazzled, and your guests will pick up on that vibe. The best way to achieve this is by planning ahead, staying on budget, and creating a fun, relaxed party atmosphere. Wondering which one was the winner of the blind tasting?? Hands down #1 was One Hope rosé, followed by Gérard Bertrand – Cote de Roses.